We are very fortunate to have on our village doorstep, the RSPB Loch of Kinnordy Reserve. This shallow loch is situated in a natural basin surrounded by farmland and attracts all types of wildlife. One favourite summer visitor is the osprey which you can see fishing around the loch, while in the winter whooper swans and geese fly in. There are three purpose built hides and you're just as likely to see otters, red squirrels and deer as wildfowl not to mention many species of butterflies and dragonflies. The reserve is open daily from dawn to dusk and entrance is free of charge with a voluntary donation cairn at the entrance. Is Loch of Kinnordy Natural or Man-made? Probably both. Historic maps show that there has always been a wet, boggy area in this location, although there is evidence that it was used for growing crops in the very distant past. In the early 1800’s it became an industrial site, as the Gairey Burn, which takes water away from the loch and down to Kirriemuir, was blasted to lower the bed level, and therefore lower the loch. This, together with an embankment, allowed the level of the loch to be lowered, and Marl was then extracted and taken away for use on surrounding farmland. When this work ceased the land was left to re-flood and the beginnings of what you see now were formed. 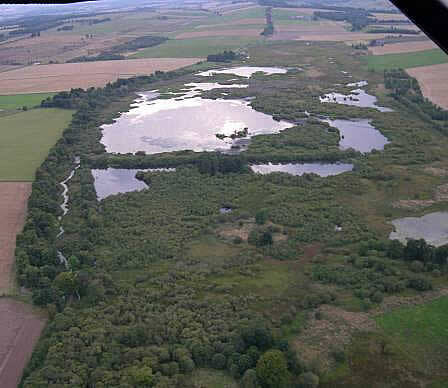 RSPB Loch of Kinnordy is a wetland oasis. It is special for many reasons, not only does it have many designations (SSSI, SPA and RAMSAR) for its habitat, breeding birds and wintering wildfowl, but it as an important area for visitors. Birdwatchers, photographers and walkers alike enjoy the hides and trails. Why don’t I see grebes or gulls here anymore? Black-necked grebe numbers declined from 1994, until in 1999 only one pair attempted to breed, and the last attempt by any was 2001. 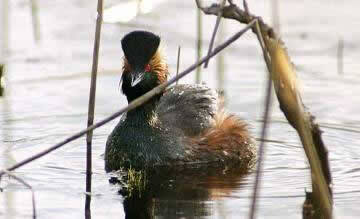 Black-necked grebe have now virtually disappeared from Scotland. •	increase in predation of nests noticeable particularly as the colony became smaller and fewer birds were present for protection. From 2007 – 2011 the Black-headed Gull colony had shown signs of recovery with birds staying through to hatching but with high levels of predation being a continued issue, the colony has been in decline since 2011. Black headed gulls are a social bird, they nest in large colonies which give them safety in numbers - they can quickly alert one another to a threat of predators. The adult birds will alarm call and dive bomb the predator with the aim of keeping the chicks safe. A reduced number of adults mean this alarm system isn’t as effective, so predation poses a much bigger threat. For this reason, in 2016, the RSPB took action by creating a raft for black headed birds to nest on. This raft floats between the natural bogbean islands. 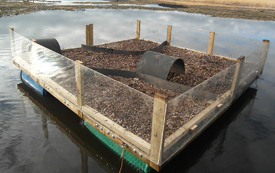 It has a gravel bed inside for gulls to nest on and Perspex sides keeping mammalian predators out. It is hoped that by giving the gulls a safe place to nest it will allow the population to increase and so allow that natural alarm call system to work effectively in the future. By their very nature lochs are transient features in our landscapes, meaning they continually change and develop. The normal course is for the vegetation to help slow water movement, and therefore increase silt build up, creating patches of dry land which will eventually merge, giving a marsh , then carr instead of the loch. It seems that when Kinnordy reached the ‘carr’ stage (the marsh was covered with extensive willow growth) the black-headed gulls were less willing to stay to nest. Kinnordy has high nutrient levels which will promote the growth of all vegetation, allowing this natural process to happen very quickly. If this is natural, what’s the problem? Naturally it would be expected that a new loch would form nearby, but in a highly managed landscape this is not possible. This is why RSPB is working to take a step back in time and re-create a place good for breeding gulls and waterfowl. There has been a lot of work carried out since 2001, including removal and ongoing management of various vegetation. 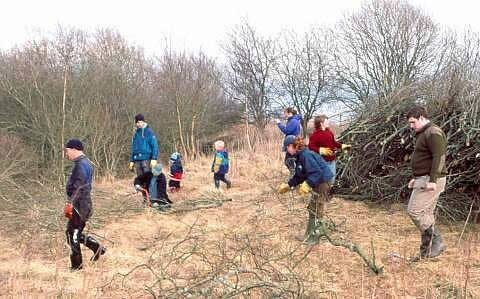 Through the winter from 2001-2004 the warden, contractors and volunteers removed willow from approximately 35ha of the reserve. This was very labour intensive as it all had to be carried out by hand, with chainsaws, and be burned on site, causing as little damage as possible to the fragile marsh community. This has been followed up each year by pruning any regrowth, and treating the stumps with herbicide to reduce the amount of regrowth. In 2011-2012 the tree removal was extended along the north edge of the Loch. This again was very labour intensive and made difficult by very wet summer conditions. 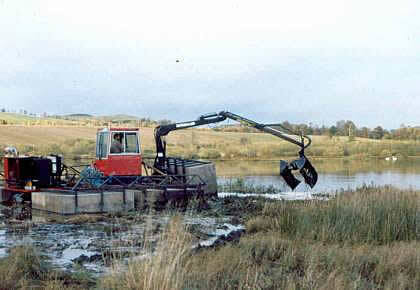 In the autumn of 2001 a semi amphibious machine was used to remove vegetation in front of the hides, and in channels which allow water movement through the loch to Gairey Burn (the outflow). This means that more water birds are now visible from the hides and we are able to manage water levels more easily to keep them high through the spring when breeding birds need water nearby, and lower them in summer to allow us to carry out work in the loch. In 2010 the channels between the Bogbean islands were beginning to narrow and with a team of volunteers the channels were opened up by hand. As well as drysuits the team used a canoe to gain access to the vegetation. 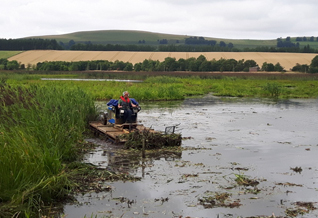 Every year hard working teams of staff and volunteers remove vegetation by both hand held tools and using brushcutters, keeping channels open for water movement and also keeping the views from the hides clear. The Truxor machine was also used again in August 2016. Removing the willow from the west end uncovered marsh vegetation which is ecologically valuable, but will become rank and eventually develop back to willow carr if left unmanaged. Initial small trials with a strimmer demonstrated the value of cutting this vegetation in the summer, leaving shorter vegetation for the following spring, which is good for breeding waders. 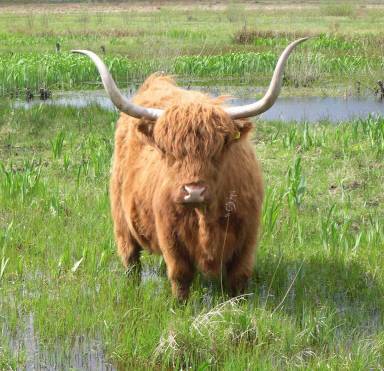 A less labour intensive method, and better as there are no cuttings left, is to graze the area, so in 2003 a local grazier introduced a few Highland cattle to the reserve and these now permanently graze around the edge of the marsh. In 2010 fencing and sowing of species rich grassland seed mix was completed on a small field to the north of the reserve and this is managed through grazing provided by the Highland cattle. Livestock has grazed at Kinnordy ever since and as well as cattle over the years there have been Konic ponies and Hebridean sheep. RSPB Staff and volunteers are at Kinnordy every Thursday, do come and say hello! Throughout the year species are monitored, vegetation is managed and maintenance to the facilities at the site is conducted. By monitoring the site to the best of our ability we can be reactive to change. We aim to keep Kinnordy the wildlife haven and visitor oasis that it is; to keep the reserve both as a beautiful place to visit and enjoy, and also to allow the very special species living here to thrive.